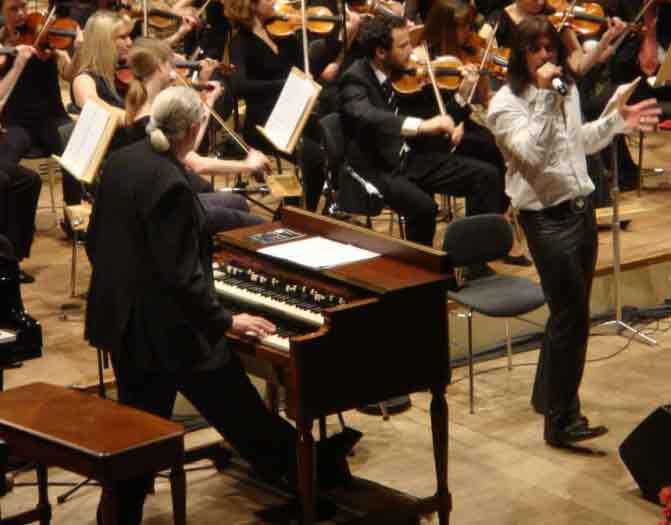 Denis Zürcher from Switzerland submitted photos and a fact sheet for Jon Lord’s concert at Zürich’s Tonhalle in Switzerland on January 10. The same set was repeated two days later in Lucerne, Switzerland – see comments below. The excellent concert was sold out and got a standing ovation. Thanks Jon, writes Denis Zürcher. Thanks also to Lars Wortmann. It was really a great concert. Jon in best mood and with very nice and british humour. Steve Lee did an excellent job, but “Child in time”, never heard live for years, was just smashing. Laska on “wait a while” was singing ’till my tears ran down. Thank you, thank you, thank you for an unforgettable evening. Back Stage (I am the “Swiss the organist”). And tomorrow replication of the KKL Lucerne! It’s the third times , I saw Jon on stage in a year. It was awesome, wonderful. Each time, your brilliant song ‘ wait a while’ makes me cry. There is a wrong note, Tonhalle sold us 10 tickets for the first row, but 3 rows disapearred wth our seats. Too sad for us. Jon, thanks for this amazing show. As I write, you must be playing in this wonderfull hall in Luzern… I was in Zurich Saturday. Just Thank you, it was THE CONCERT that I’ve been wayting for years…. We (Ferry, Kruti, Andy and me) drive from Vienna to Zürich to see this excelent show. It was a dream to see Jon Lord again after 30 years live on stage. Steve Lee was a highlight with “Child in Time” – as we hear, that Steve is singing, we hope that Jon will change the program and we can hear this wonderful number. Thanks again for this unbelieveble evening. It was an unforgettable night! Thank you so much (and again), Jon, for your wonderful, wonderful music! The Concerto is one of my favourite pieces of music, and hearing this live was like a gift to me. But hearing Child In Time, and in such perfection – well I was overwhelmed, was having gooseflesh all over and tears in my eyes. Thank you Steve and thank you Jon for a precious and lasting memory! Btw: the biscuits were homemade, forgot to mention ;-). Dear Jon, thanks to you and to all other artists who were involved in the wonderful concert yesterday at Lucerne’s KKL Concert Hall. It was a great experience. Everyone was on top. With you Jon, and both the band and the excellent Nota Bene Sinfonieorchester provided to me the opportunity to be in and to dream with your music. I hope to see you all again. it was a great pleasure to see and hear you in zürich! your music is wonderful, your playying extraordinary! in my ears, you are the greatest (rock-) organ player ever! steve lee did an absolutely great job on child in time. hope to hear this again. I hope, you’ll return to Switzerland soon! It was a brilliant evening in Lucerne! We came all the way from Zermatt to hear and see you and your magnificent musicians. Congratulation! It was a pleasure to see how two such different types of music styles became one big family. Musicians had so much fun and played with lot of enthusiasm. Jon, you should have seen it from the auditorium! Special congratulation as well to the singers! Simply brilliant! Hope to see or even better hear you Jon once more in Zermatt or elsewhere. Keep on giving the people the creeps with your music. Thanks for your music and your humanity ….. and best wishes to grandfather and grandson. First, sorry for my bad English …. Since he left DP, I hope to see Jon solo work. Zurich was not too far from home (2 hours driving). My daughter from 7 years old, need for à long time, to be with me in a rock show in the first row (She came last year with me and my wife in DP show but we are sitting very far from stage).For this show I buy tickets in the FIRST ROW, just in front JON for me, my wife and MY DAUGHTER Mélanie and for some other French friend coming from Paris. When we arrive in the Tonhalle, the guy at the entry say me in German that there is a problem with the 3 first row and we have to go to information desk to “have other place”. That’s not a very good beginning …. I show my 7 years old Daughter and ask him for what she can see from the back with big people in front of her….. He offers us the last possibility, some seat, on the edge of the hall, not very far from the stage… It’s show time, we don’t have any other possibility …. There are not enough seats, and my daugher must go on my wife knees and I must remain standing like some other from my friend. due the P.A. I see 30% of the stage, but in chance we see Jon, but we see only is back …. At the Break [intermission], a friend of mine sees one of Jon Manager and speaks about the probleme. He say he can do nothing (Of course it’s tonhalle problem) and say that we have to stay at the end of the show right from stage , and Jon will come to see us …. Great. We stay at the end, Steve Lee (from Gotthard) is coming and we can congratulate him for this AMAZING Child in time version. We stay waiting one hour, and someone came and say us that Jon was not here …. He left the hall some minutes before ….. erything wrong from beginning to end !!!! Thanks to JON for the 2 last song (not on the official programm) Tomorrow’s just Begun (From Last gotthard album) (Denis Zucher forget it in his review) with Leo Leoni and this fantastic CHILD IN TIME. Regrettably this show will not be in my memory like a great show due the above problem. But I think if we have your first row seat It will be one one the BEST show I ever see. Sorry for this “bad” review , but I’m my angry ….. Thanks Jon for the most wonderful Evening in my life.The Concert in KKL Lucerne. I never will forget it. Tonhalle. I enjoyed every minute of this evening. real Gentlemen with a great sense of humour. My wife and me were in Lucerne, simply a fantastic concert. The biggest flash was “Child in Time” sung by Steeve Lee, my wife’s faforite Deep Purple song, which we didn’t hear life since years. I think all of us who were swindled by Tonhalle, should to demand redress to Tonhalle. They made the mistake, they have to pay for. Abba sings: thank god for music, I wanna thank Mr. LORD GREAT music influencies and great moments of music. So many years I though Blackmore’s name. He is still guitargod. But Lord is one of most influences scene creator in organs. Probably most influenced. Absolutely greatest. I miss him in the Purple, like mr. Blackmore. Two of most influenced is gone away, but not our hearts.